When Santa Fe visitors step into the Matthews Gallery, they often mention that something feels different. Our gallery location is in a historic adobe on Canyon road just like many of the other galleries so we have a hunch that the novelty they’re sensing is our devotion to carefully curating every wall of our gallery. Mary Cassatt (1844-1926) ~ The American painter and printmaker was refused entry to the Ecole des Beaux-Arts, so she studied the masters on her own at the Louvre. She would become a master herself, named one of “les trois grandes dames” of Impressionism by Gustave Geffroy. Pablo Picasso (1881-1973) ~ Several works by the most influential artist of the 20th century have passed through the Matthews Gallery. Our most notable current work by Picasso is “Les Saltimbanque”. The drypoint etching the artist created as a teenager shows the harlequin, a personal symbol that would recur in his work throughout his career. Fernand Leger (1881-1955) ~ The painter, sculptor and filmmaker’s lithograph “Composition aux deux Personnages” marked a shift in his oeuvre from Cubism to bold figurative works that would later identify him as a forerunner of Pop Art. As is the fate of all art movements, Picasso and Braque’s Cubism were irrevocably fractured. Harold Frank (1917-1995) ~ Born in Southampton, England, Frank’s family moved to New York when he was a child. You can see influences from both shores in his colorful canvases that take cues from modernism and abstract expressionism. Enrique Echeverria (1923-1972) ~ Echeverria and his contemporaries brought the ideas of modern European art movements to Mexico and subverted the traditional figurative painting style. They became known as the Generacion de la Ruptura, the Rupture Generation. Robert W. Hinds (1924- present) ~ This World War II veteran was born a year after Echeverria. He had a successful graphics career for years before moving to Europe to study casting techniques in Italy and Bologna. 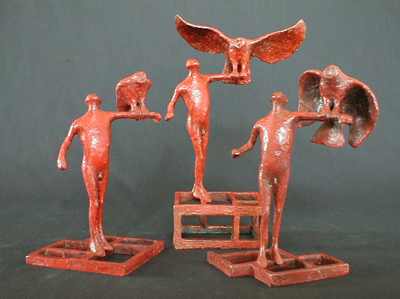 Now he produces figurative bronze sculptures that are collected throughout the world. Jamie Chase (1954- present) ~ The painter and graphic novelist was born in California, and traveled to Europe to educate himself on the work of the masters. He moved to Santa Fe in 1980, where he’s now known for his non-objective paintings, abstract landscapes and abstracted figurative paintings. Browse all of the artists we represent here, and follow our Facebook and Twitter accounts for updates on their work.